Lorna was born c.1920 in Yumurrpa country, which is situated near Chilla Well, south of the Granites Mine Area of the Tanami Desert. Yumurrpa is an important Yam Dreaming site, and the yam is a food staple for desert people that also hold important spiritual significance. 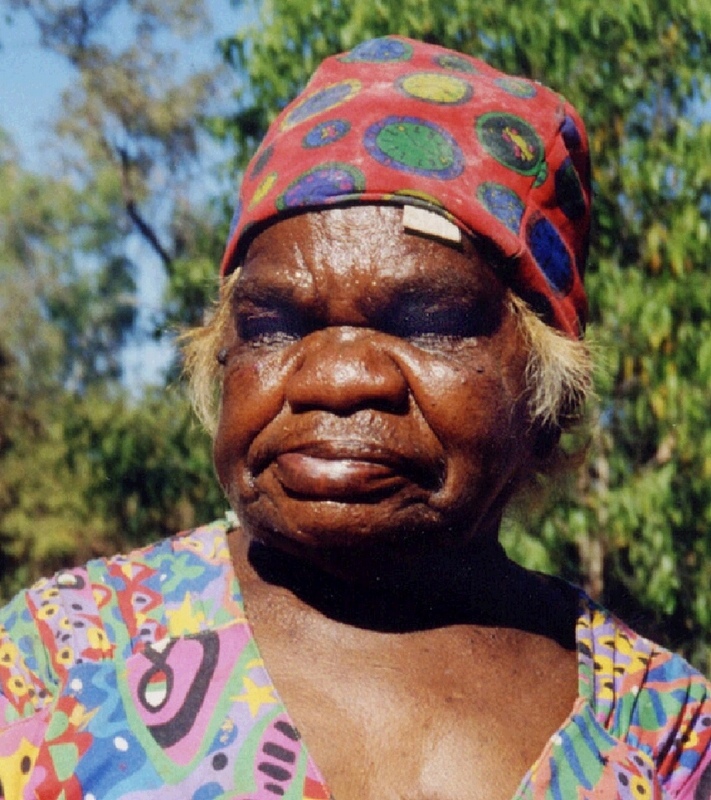 In 1949 many Walpiri people, including Lorna, were forcibly transported to the government settlement of Lajamanu at Hookers Creek, roughly 250 miles to the north of their own country around Yuendumu. Lorna nevertheless maintained and strengthened her cultural identity through ceremonial activity and art, and asserted her position as a prominent elder and teacher in her community. Lorna was a skilled painter of decorative body designs for women's ceremony, and in 1986 began to paint artworks on canvas. Over the next twenty years Lorna became a greatly admired artist who, along with Emily Kame Kngwarreye, pioneered the women's art movement. They departed from the traditional iconography that men painted to a more personal and artistic expression. Lorna had a strong personality. She has been described as a non-conformist, revolutionary, tough, funny, flirty, bossy and wicked, with a rapier sharp wit. There was an energy and independent nature about her which is reflected in her paintings. She was a senior custodian of several Dreaming stories, and the assertiveness with which she painted was evidence of her great knowledge of her culture. The Yarla Dreaming, which tells of the ancestral women from the Napurrula and Nakamarra skin groups searching for bush potato, is a dominant theme in her work. Lorna's art is extremely bold, free, expressive, abstract and experimental. Many of her artworks burst off the wall with a physical or emotional force that a photograph simply cannot capture. One example of this is her well known painting entitled Grief (1997) which was painted following the death of her son. Lorna sadly passed away in December 2006. She is remembered as a vivacious woman and an important community elder. She is also acknowledged as making an important contribution to Indigenous Australian art. Represented in the National Gallery, State Galleries and major private collections, Lorna's work has always been in strong demand, particularly for the discerning collector. Her work is highly valued. Christensen Collection, held by Museum of Victoria, Melbourne. 2005 All About Yumarrpa, Vivien Anderson Gallery, Melbourne. 2005 Decouvrir, Rever, Investir, Australian Embassy, Paris, France. 2004 The Dancers - Warlpiri Women, Art Mob, Hobart; Colour Power -The Ian Potter Centre, NGV Australia, Melbourne. 2004 21st Telstra National Aborigainal and Torres Strait Islander Art Award, Museum and Art Gallery of the Northern Territory, Darwin. 2003 20th Telstra National Aboriginal and Torres Strait Islander Art Award, Museum and Art Gallery of the Northern Territory, Darwin.